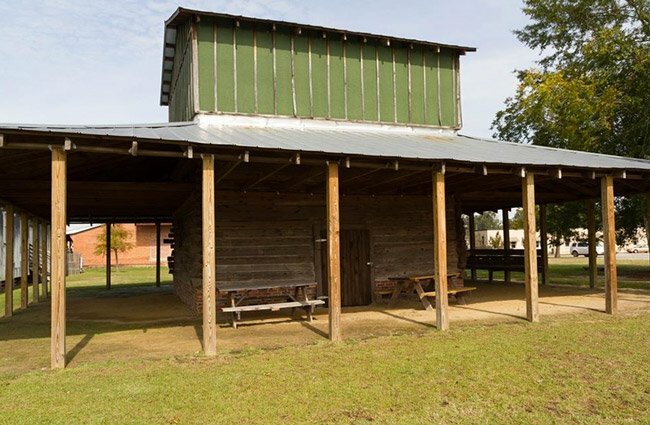 This restored pole barn in downtown Lake City was built in the early part of the twentieth century and stands as a reminder of the area’s rich agricultural heritage. A leading tobacco market since the late nineteenth century, Lake City commemorates the work that goes into tobacco preparation with this interpretive exhibit. The barn was moved to its current site behind the Lake City Depot in 2008 by the Community Museum Society of Lake City, which also maintains the historic Bean Market. Features of the tobacco barn, or pole barn, include a log structure with a brick foundation and furnace. The furnace heated the barn to dry, or cure, the tobacco leaves. Flues, or openings, were built at the base of the barn to circulate the heat. 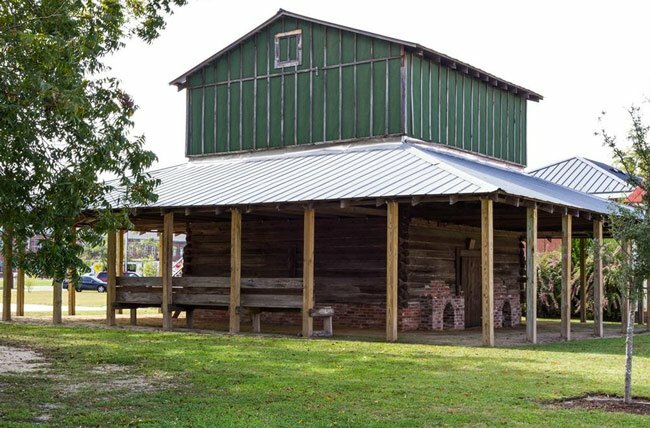 The shed surrounding the barn provided shade during the stringing process, wherein workers attached tobacco leaves to poles – hence the name “pole barn” – to be hung within the barn. The poles would then be affixed horizontally inside the barn, with the leaves hanging to dry in the heat. 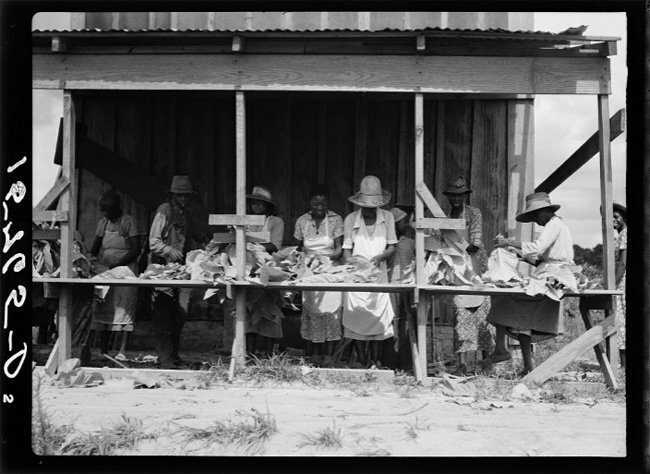 The historic photo below depicts people stringing tobacco in Florence County in 1938. Today the Lake City Pole Barn is used for special events, such as the annual Tobacco Festival held in September, and ArtFields, a nine-day art competition hosted in Lake City each April. Visitors are invited to walk around the barn at any time, though the interior is not open. We understand the concern over the name, but their official name is The Pole Barn. Their Facebook page is located at https://www.facebook.com/ThePoleBarnLakeCity/. I was born and raised in tobacco country and never heard tobacco barns called anything other than tobacco barns. Pole barns are called pole barns because they’re supported by poles embedded in the ground, which is not the way tobacco barns were built. Yes, the exterior is public!